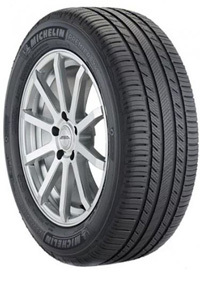 The Michelin Premier LTX is a Crossover/SUV Touring All-Season tire designed for pick-up trucks, light-duty vans, crossovers and sport utility vehicles. The Premier LTX tire delivers exceptional traction when new also when worn. When compared to leading competitors the Premier LTX tire delivers a shorter stopping distance on wet roads even when worn. With the Premier LTX tire, drivers are guaranteed year round traction on icy road conditions and in light snow. The tire features advanced silica and improved sunflower-oil tread compound that increase its traction capability in wet and cold weather conditions. This compound is shaped into a symmetric tread design with continuous center rib bordered by notched shoulder blocks. The Premier LTX is Michelin’s Total Performance tire that uses advanced technologies to bring together multiple performances. Every Total Performance tire from Michelin has the capability to combine driving control, stopping power, improved fuel efficiency and enhanced traction in all weather conditions.